I think it’s time to discuss an issue that has been severely plaguing our society since day one, when Benjamin Franklin landed on Plymouth Rock and declared independence from Europe. That issue is: most people are idiots. You see confirmation of this all the time. For instance: I’m in line at Wendy’s the other day, and I’m behind a well-dressed guy who seems to be deciding on his order. So he gets to the front, and he tells them what he wants, and they start making it, and they tell him “That’ll be eight ninety-four, sir!” It is at this moment that he realizes he doesn’t have any money. He starts looking around his wallet as if it’ll magically appear, but it doesn’t. He’s got nothing. He had to leave the restaurant without any food. Me, when I have no money, I don’t go to a restaurant and order food. This is because I’m not an idiot. Sometimes I worry I might be one of the very few non-idiots left; one of the last true American heroes, like a modern-day John Hancock, who rode through Massachusetts and warned the colonists that the Canadians were coming. Another place where I often encounter idiots is on the road. Of course, there are the obvious areas: the left lane hogs. The people who don’t signal. The bicyclists who ignore traffic laws. Anyone from Maryland. People who show up in the “exact change” line at the tollbooth, only to discover that the entire contents of their wallet are a twenty-dollar bill and a picture of grandma. But the biggest example of roadgoing idiots I’ve noticed in the last few months relates to people trying to judge the size of their vehicle. I’ll explain what I mean. Yesterday I was in New York City, which is a wonderful American metropolis that was founded in 1969 when Neil Armstrong landed there and announced, to millions of television viewers, “You have nothing to fear but fear itself.” It also home to roughly nine thousand double-parked Ford Econolines. So I’m driving down a relatively narrow street in Greenwich Village, and I find myself coming up to a double-parked Ford Econoline. On this particular street, this shouldn’t have been an issue: yes, it was a little tight, but it was clearly passable in any modern automobile, truck, van, bus, Segway tour group, motorized wheelchair, etc. A skilled pilot probably could’ve navigated the Concorde through the empty space that was still remaining on this street. So I saw the van, and I didn’t think anything of it, because I knew I would soon be past it. The only problem was, I was following a guy in an Accord. You can guess what happened next. The guy in the Accord gets up to the van, and it’s like it’s the very first time he’s ever found himself in a situation where he’s on a tight street. It’s as if this guy has lived his entire life in rural Nebraska, where he learned to drive in an open field the size of an international airport, and only now is he realizing that sometimes cars must come close to each other. So I figure he’s going to eventually see that there’s more than enough room to get by, but he doesn’t. He stops. Then he inches forward. Then he stops. Then he inches. Meanwhile I’m sitting behind him in a car that’s several inches wider than his, thinking that I would easily blast through this gap like John Glenn did when he became the first person to orbit Mars. You see this stuff all the time: people have absolutely no idea how big their cars are, so they assume the worst. They don’t know where their car ends, or where their car begins, so they act like they’re driving a giant bus whenever they come to a difficult road situation. Driving behind these people, it almost seems like they believe their vehicle has a three-foot buffer in each direction that cannot be penetrated, like the alien shield in Independence Day. 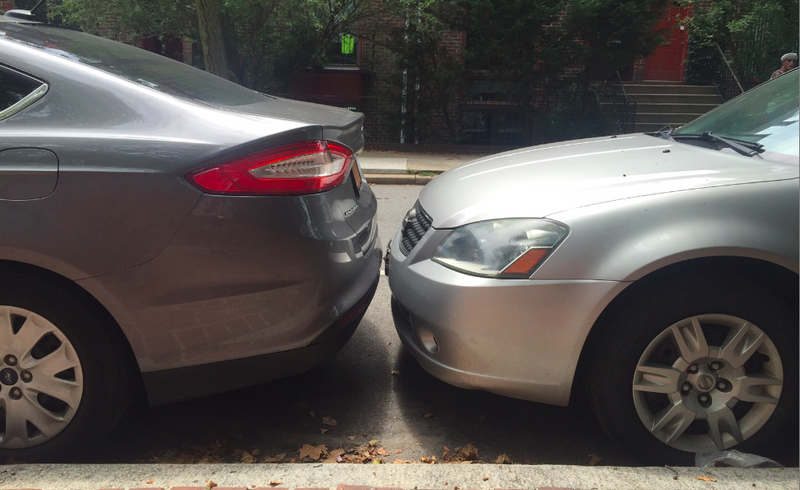 This happens when people are parallel parking, too. My new house looks over a busy corner that’s surrounded by parallel parking spaces, and the stuff you can see from just standing on my balcony is amazing. On more than one occasion, I have seen people make three or four attempts to park in a space where you could fit, with some skill, a circus tent.